Welcome to the games section of the site, our extensive archive all about the 'classic' Zelda titles, that were released on Nintendo's first three consoles back in the late 80's-early 90's. The story all began way back in 1987, when Zelda I was released on the NES. During its time, it was a new revolution in rpg gaming, and was so popular, that it was re-released several times. The story revolved around a young adventurer named Link, a beautiful princess named Zelda, an evil wizard named Ganon, and a mystical artifact, The Triforce. Today, the concept remains much the same, the legend continues with an ever-growing library of games. 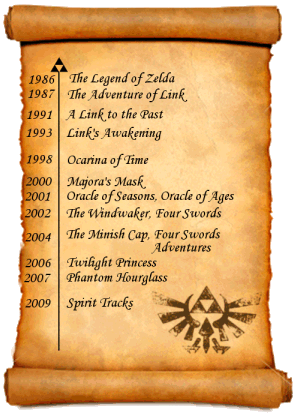 The most famous is The Ocarina of Time, released for the N64 along with its sequal Major'as Mask. For the GBC we were treated to the interlinked adventures Oracle of Seasons and Oracle of Ages and most recently, the Zelda 3 remake/Four Swords multiplayer cartridge for the GBA. The Wind Waker was released for the GameCube in summer 2003, once again proving why the series is one of the finest and most loved RPGs in the world. Games like Twilight Princess and Phantom Hourglass show new, amazing innovation to the series. Fans are excitedly anticipating the latest addition to the series - Spirit Tracks due for release in 2009. In earlier years, there were three Zelda titles also released on the Phillips CDi machine and there have been numerous spin offs and cameos for the series too. Although the latest games boast beautiful graphics and sound, and to some, better gameplay, in my opinion, the first four titles in the series are some of Nintendo's finest achievements. Every one different in its own way, never failing in quality, playability or lastability. These are truly vintage Zelda, the legacy the games have been built on. All four are top down view (although AoL contains side-scrolling elements). In the menu opposite, you can choose which game you'd like to find out about, and each mini-section includes full story of each game, plenty of screenshots, reviews, walkthroughs, manuals, FAQs, cheats and more. Just click on the desired screenshot to find out more! For now I have decided not to cover the later games - some of them I haven't been able to play because I don't own the console, and mainly because there are a lot of Zelda sites out there that have extensive guides to the newer games. I felt the originals deserved a special place on the internet and North Castle, due to its age and style is the perfect site to pay homage to the vintage titles. Several titles have been released that are set within or star characters from the Zelda universe. The Wii has 'Link's Crossbow Training' released in 2007 and bundled with the Wii Zapper. There were two DS games starring Tingle - the rpg Tingle's Rosy Rupeeland released in 2006 and also Tingle's Balloon Fight - an arcade platformer released in 2007 available only to Platinum Club Nintendo members. The Satellaview console add-on also had a few spin-off games, BS Zelda no Densetsu Kodai no Sekiban (BS The Legend of Zelda: Ancient Stone Tablets) which stars the 'Hero of Light' (Broadcast Satellaview's male or female mascot) as Hyrule's hero rather than Link. It is pretty much like LttP but with a different storyline - kind of like a second quest. There was also BS Zelda no Densetsu (BS The Legend of Zelda) which was a graphically enhanced remake of the original Legend of Zelda. Again, instead of Link it starred the 'Hero of Light' instead. For more information on the system and games check out The BS Zelda Homepage. Link has featured in several other Nintendo games. Most notably, OoT Link can be chosen as a fighter in Super Smash Bros. for the Nintendo 64, Super Smash Bros. Melee for the GameCube and in Super Smash Bros. Brawl for the Wii. Zelda/Sheik, Ganondorf and Young Link all appear in Super Smash Bros. Melee. The Super Smash Bros. Brawl Zelda characters are based on their TP designs. Young Link is replaced by Windwaker Link. Link also makes a cameo appearance in Super Mario RPG and the Warioware games. Finally Link also appears as fighter in the GameCube version of Namco's Soul Calibur II. In the early 90s Nintendo signed a deal with Philips (after pulling out from a deal with Sony who later went on to create the Playstation) to make a CD add-on for the SNES to allow for FMV and larger games. However after seeing the poor reception of Sega's Mega-CD, they scrapped the idea and in ending their agreement with Philips, Nintendo gave them the license to use some of their own characters for games on Philips's own console - the CD-i. Three Zelda titles were published in total. Faces of Evil and Wand of Gamelon released in 1993 and finally Zelda's Adventure in 1994. The first game stars Link and the second two, interestingly are played as Zelda. All the games contained FMV and live speech however suffered from terrbile control systems and considered by some to be some of the worst games ever made - a stark contrast to Nintendo's own series. Nintendo do not acknowledge the CDi games as part of the canon series. The characters were loosely based on their cartoon show counterparts.